The create checkpoint functionality has been updated so that is does not does not checkpoint unchanged subprojects. However, there is no functionality to apply the labels to unchanged subprojects so labels are missing from the project view and members do not reference the subproject labels that they are included in. This requires a two step process to apply labels, which should be reduced to one. Thanks for submitting the idea. We value your feedback. Could you please elaborate on the use case your organization is trying to address here? As an example, I want to be able to do a formal checkpoint which includes all the items that go into the release. If the subproject is unchanged since the last checkpoint then no checkpoint will be taken by default and no label is applied. The member history lists the checkpoint label(s) that revision is in. If no label is added to the subproject then nothing will appear in the member history. I want to be able to not create checkpoints unless required but I still to have the labels applied. The only way to do that at the moment is to create the checkpoint and then do a separate action to add the project label to the project. Thanks for providing further details. We try to consider implementing this idea in future release for Integrity. There is now an option to label unchanged subprojects. 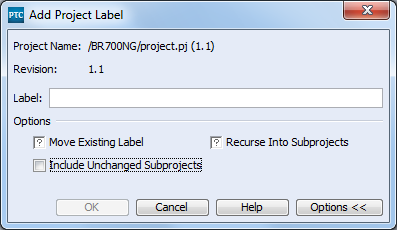 "The Label Unchanged Subprojects option adds the project label to both unchanged subprojects and build subprojects. 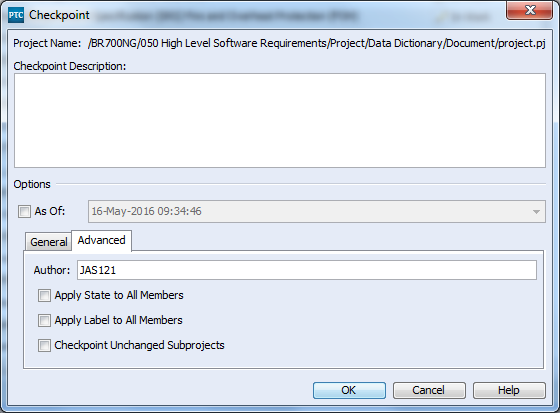 To reduce the command impact on users, the labels are applied after the lock on the project hierarchy is released." On the CLI the option is "--[no]labelUnchangedSubprojects"